We wish to inform that MIKROELEKTRONIKA development kits are available at TME’s warehouse. They have been designed based on the FTDI’s FT800 circuit. 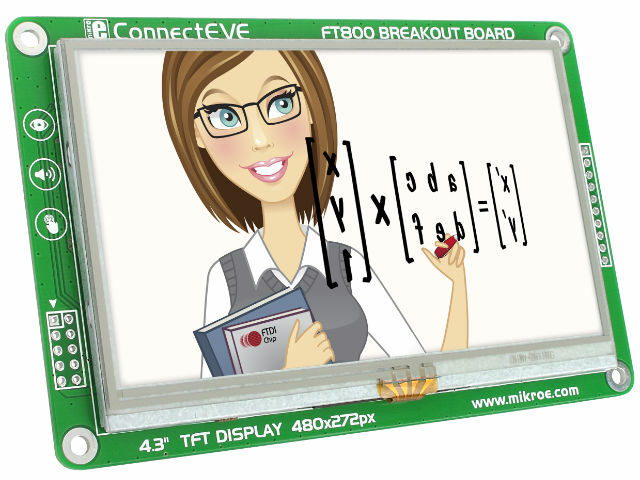 These elements combine functionality of TFT graphic display controller (with the QVGA and WQVGA resolution), touch panels and audio. These are the first kits in the market allowing actual testing of the latest, long awaited FTDI’s FT800 circuit. Additionally, software package is available that allows object-oriented programming of displayed graphic interface appearance. According to the information provided by the manufacturer, the FT800 circuit will be available in production quantities in the 3rd. quarter of this year.